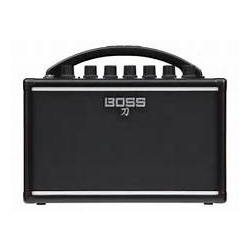 With a multi-stage analog gain circuit and three selectable voicings, the BOSS Katana Mini combo amplifier delivers big tone in a compact, portable package. The Brown voicing delivers iconic high-gain tone â€” perfect for metal leads. Crunch offers overdriven rhythm tones, while Clean provides sparkling tone with a wide dynamic range that is perfect for use with your pedals. Factor in battery power and a convenient handle, and the BOSS Katana Mini combo amp is your ideal portable practice partner.